Misty this is a Fu Dog. Chinese guardian lions, also called a Fu Lions, lions of Buddha, or sometimes stone lions (獅子, Pinyin: Shíshī) in Chinese art, is a common representation of the lion in pre-modern China, which is believed to have powerful mythic protective powers that has traditionally stood in front of Chinese Imperial palaces, temples, emperors' tombs, government offices, and the homes of government officials and the wealthy from the Han Dynasty (206 BC-220 AD), until the end of the empire in 1911. There are Fu/Foo Dogs in real life also, but unfortunately I don't have a picture of one. Other Camera Critters participants are here. We have a houseful of these critters. Your dragon is so beautiful!! I haven't been over here forever!! Nancy my special needs daughter who has lupus was in the hospital in June. She had to have two units of blood. Just beautiful! I love dragons. In my younger days I had a 3 foot tall ceramic Foo Dog and I loved it -- then the movie Amityville Horror came out and their ceramic Foo Dog came to life and tried to kill somebody. I put mine in the back of a deep, dark closet and don't remember ever seeing it again. Fu,Foo to you too! Great critter post. So regal looking. What are real live Fu dgos?? Not those Shar-pei wrinkly ones?? I'm intrigued, but Google images only seems to have statues. I have a houseful and yardful of Buddhas, but no Fu's. Now you've given me the idea, I need a Fu or two! 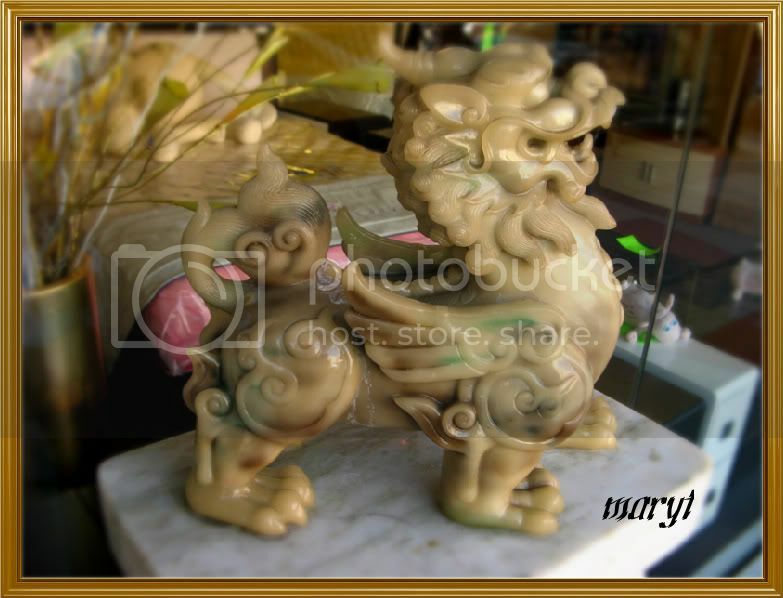 Thanks so much for the foo dog link - they have such nice friendly faces, and gorgeous coats, I just want to hug them! I can't beleive you're able to find so many dragons, Mary! I have some friends that have a Papillon dog- one of many breeds that I refer to as fu-fu dogs. hahaha! I love that dog, Mary! We have several Fu Dogs in our possession too. I have photos taken of them, but never blogged about them. There such an interesting creature, and I love the lore behind them. Gorgeous! I love the purple color I see embedded! You have had some stunning items lately Ms.Mary! That's a lovely image. I think they are auspicious creatures.